The moment I saw the whole Tom Hiddleston/Taylor Swift thing, all I could think was, wow, that's going to be one perky relationship :). BTW - if it makes them happy, good for them! So Soph and I had a lovely time in town yesterday doing our ladies that lunch thing :). We shopped for about an hour and 3/4 (we're get bored quickly when shopping :)) and then when to lunch in a lovely tea shop called Tiny Tims Tearooms. It is a really lovely little place with more types of tea and coffee than you can shake a stick at, and wonderful, freshly made food. Could not finish it :) They also have lots of different cakes and they do afternoon tea in various versions. Their scones are to die for. Later we watched Suburban Gothic. 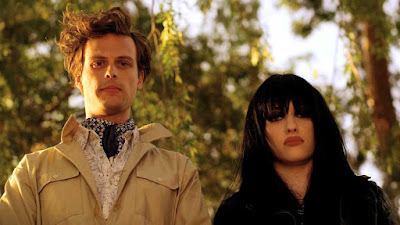 It was what you might called quirky, but it stars Matthew Gray Gubler and Kat Dennings, so what's not to love? It's about a young man called Raymond who has to move back in with his parents because he can't find a job. He can interact with the paranormal and when the landscapers find a body in the back garden of his parents' house, bad things start to happen that only Raymond can sort out. He enlists the help of bar tender Becca as they try and figure out what's going on. This entry was originally posted at http://beren-writes.dreamwidth.org/348722.html.